은 오사모에 단령을 입고 의자에 앉아 있는 전신좌상이다. 가슴에는 모란과 운안(雲雁) 문양을 한 흉배가 부착되어 있으며, 삽금대를 두르고 있어 1603∼14년에 정이품의 대사헌과 이조판서를 지낸 송언신의 당시 품계와 정확히 일치한다. 안면은 좌안 7분면이며 몸체는 8분면 정도이다. 공수자세를 취한 단령 사이로 흰 창의의 소매가 보이며, 의자의 손잡이는 인물의 양 편으로 뻗어 있는데, 이러한 표현형식은 이중로영정 등 정사(靖社) 공신상 보다는 앞선 형식이다. 바닥에는 채전이 깔려 있고 족좌대(足座臺) 위에는 팔자형(八字形)으로 벌린 흑피혜(黑皮鞋)가 보인다. 사모의 채색에 있어 앞쪽은 흑색으로 일관하여 시채되어 있지만 뒤쪽 솟은 부분은 진회색으로 처리하고 있는데, 이런 기법은 시대적으로 보다 뒤에 나오므로 복원 이전에 가채가 있었던 것으로 보인다. 안면은 약간 토황색(土黃色) 기운이 있으며, 눈썹의 털을 확연히 그려내고자 하였다. 안모의 외곽선을 짙은 토황색으로 윤곽 지웠으며, 눈동자는 동공은 검은 색, 그 주변은 흑회색으로 칠하였다. 얼굴에는 음영법이 거의 들어가 있지 않으며, 단지 법령과 협, 그리고 귀의 이문(耳紋) 부위에만 선으로 처리한 주변에 약간 음영을 삽입하였다. 수염 처리는 흑색 선 위에 백색 선을 올을 따라 그렸는데, 약간 곱슬거리게 표현하였다. 옷은 창의는 흰색 이지만 박락부분이 있으며, 또한 흑단령과의 연접부위가 깨끗이 처리되지 못했는데, 이것은 원본을 충실히 복원하였을 것이므로 원본의 상태가 이미 그러했던 것으로 보인다. 단령의 외곽선은 부드럽게 처리한 데 반하여 공수자세 부위의 주름이나 윤곽은 각지게 처리되어 있고, 옷 주름은 몇 개의 선만을 뽑아 매우 간단히 균일한 선으로 처리하였다. 흑단령의 문양은 많이 벗겨져 있으며, 채전의 문양은 도드라지게 표현되어 있지 않다. 단령의 트임 사이로 보이는 고와 단령의 안감은 뭉그러져 있다. 다소 올이 거친 비단을 사용하여 올이 완연히 드러나며, 화폭의 외곽 쪽으로 박락이 있다. 정확한 초상화 제작시기와 화제시를 쓴 시점은 확실히 단정 짓기 어려우나, 표제가 최소한 선조가 승하한 뒤인 ‘선종(宣宗)’이라는 묘호가 정해진 광해군 즉위년(1608) 이후에 쓰여진 것이며 또한 왼쪽 제시 중 ‘신해(辛亥)년 봄’이라 하였는데 이 시기는 송언신이 죽기 1년 전인 1611년 봄을 가리키는 것으로 추정된다. ‘광거(廣居)’ 역시 만년에 송언신이 은거했던 광주(廣州) 방암(放菴)을 가리키는 것으로 보인다. 17세기 초의 공신상(功臣像)으로 옷주름 표현, 채연(彩筵)을 깔고 좌안7분면(左顔七分面)의 자세로 앉아 있는 형식 등은 이 시기의 전형적인 특징을 보여주고 있다. 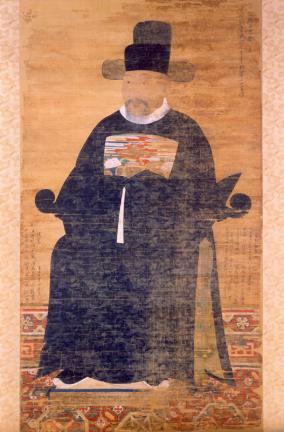 The portrait depicts the full figure of Song Eon-sin sitting in a chair wearing a ceremonial robe, a tall hat, and a topcoat. The rank badge on the breast is embroidered with peony, wild geese, and clouds, and the golden belt around his waist indicates his official rank at the time from 1603 to 1614. He served as inspector-general and minister of personnel, both of which fell under the category of senior grade of the second rank. His face and body are slightly turned to the right, exposing more of his left side. His folded hands are hidden in the sleeves, between which the hems of his white shirt are visible. The arms of the chair, projected outward, represent the earlier mode of expression than that of portraits of other meritorious subjects including Yi Jung-ro. A carpet is laid on the floor, and his feet, wearing black leather shoes, rest on the footstool. The bottom half of the tall hat is painted black, whereas the upper half is dark grey. Because this technique is typical of the portraits in the later era, some retouch of color is assumed to have been done even before the restoration. The face has an ocher yellow tint, and the eyebrows are depicted in detail down to the hair. The outline of the face is drawn in darker ocher. The pupils are black, and the other parts of the eyes are dark grey. The face is hardly shaded, but slight shade is applied to the furrow alongside the nose, cheeks, and outer orifice of the ear. The beard is treated with black lines, along which slightly wavy white lines are added. The white of the undershirt is peeled off slightly, and the lines along which the contrasting colors of the shirt and topcoat meet are not clear-cut. Given the fact that the restoration procedure emphasized the preservation of the original as it was, the lines must have been rough initially. Although the outline of the topcoat is mostly round, the sleeves and their creases are notably angular. The wrinkles in the clothes are expressed with a few simple lines. The patterns on the coat fabric have been rubbed off a lot; the design of the carpet is not vivid. The color in the lining cloth is smeared, and the strings are revealed between the side-slit of the topcoat. The texture of the silk canvas is so coarse that its warp and weft are visible. The edges of the silk canvas are a bit frayed. It is hard to tell exactly when the portrait and its script were produced, but the script is assumed to have been written after the year King Gwanghaegun acceded to the throne (1608) because the word in the main title “Seonjong (宣宗)” was the posthumous name of King Seonjo, which started to be used after that year. The phrase “the spring of the Sinhae (辛亥) year” on the left part of the background is presumed to be the spring of 1611, a year before Song Eon-sin passed away. The word “Gwanggeo (廣居)” is also believed to indicate Bangam in Gwangju, the place where he lived in retirement. The painting shows the characteristics typical of portraits of meritorious subjects in the early 17th century with its expression of the creases in the clothes and the posture of Song Eon-sin sitting in a chair slightly turned to the right on a carpet.